I'm trying to get some cards made ahead this year. Flipping through my scrapbook sketches one day I wondered if I could use one of those as a card sketch. 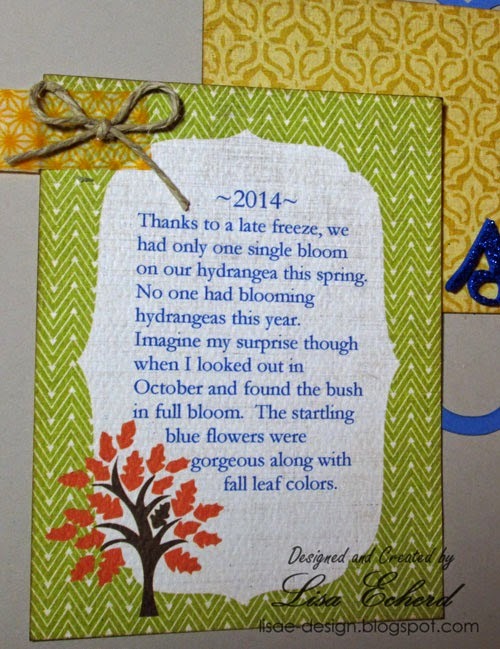 This card is made from the very first sketch in the 2014 Sketchbook: 52 Scrapbook Layout Sketches. Click on the title for more info on the sketchbook. I think there will be another of these coming along using a sketch that would be perfect for a Valentine card. 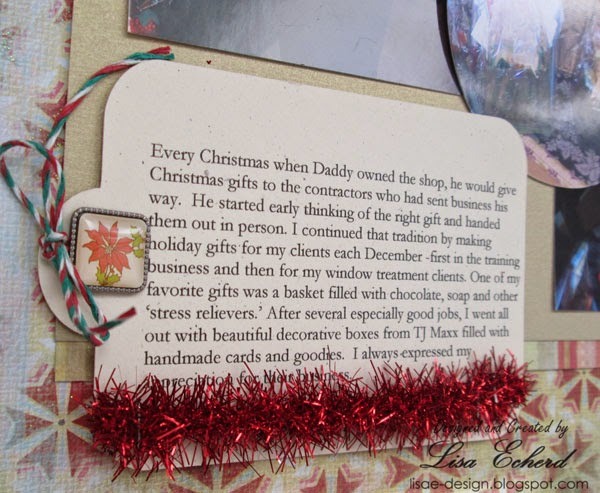 Just a reminder: True Scrap individual classes are on sale through 1/31. Also it isn't too late to join me for Layout A Day (LOAD) starting February 1. Before I got to the banner, I started playing around with creating my own gold metallic transparencies and vellum designs. I just love all the metallic gold in papers, transparencies and embellishments in the new products. I'm not normally a glittery person but for some reason I was really drawn to it. I have a video below on making your own gold, silver or bronze patterned transparencies. For the banner, I used this technique to create a gold dotted overlay. 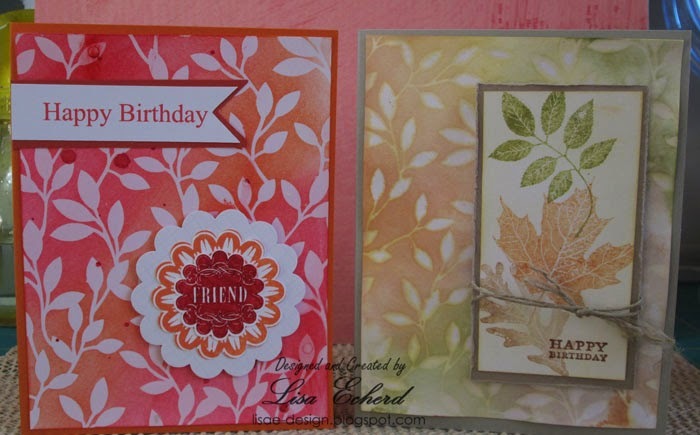 "Celebrate" was cut on the Silhouette and then edged with gold American Crafts embossing powder. 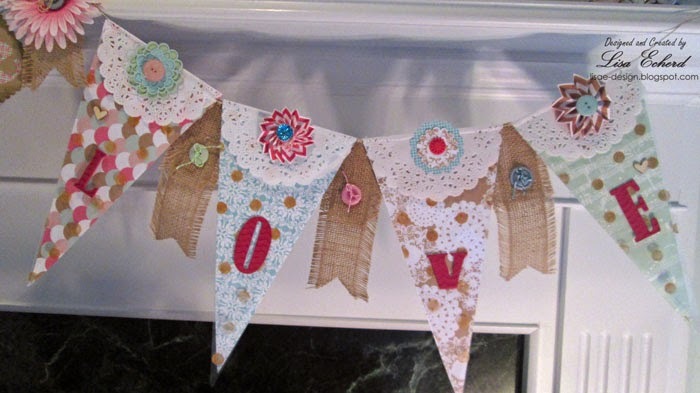 After I got it put up, there was something missing so I added the bits of burlap in between each letter of LOVE. Sorry, the photos aren't the best. It got too dark yesterday when I finished it and it is another gloomy day here today. I'm planning to put this on my Etsy shop - Lovely Layers Art. We are enjoying it for now. I think this would work well for a bridal shower, luncheon or as home decor. I imagine I'll be doing quite a bit of gold in my coming layouts. I may become a glittery person yet. Reminder: TrueScrap Individual classes on sale through Jan 30. More here. I've started on my newest class layouts so I don't have a scrapbook process video for you this week. 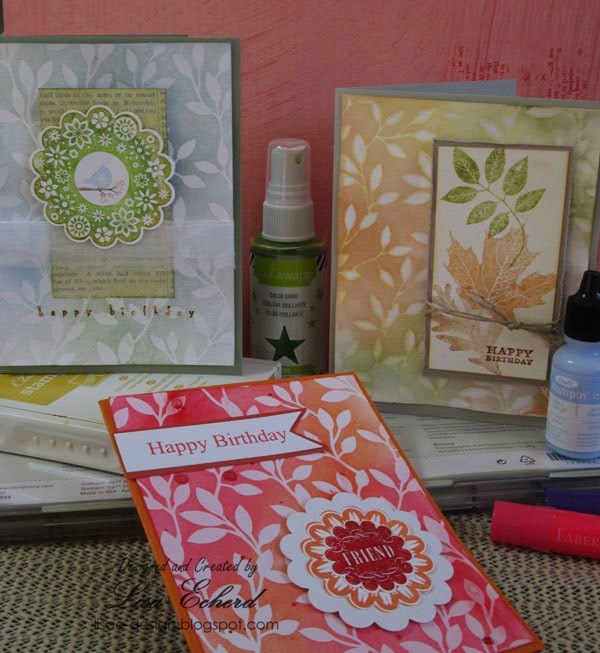 However, I made several cards this past weekend and filmed some of the process. 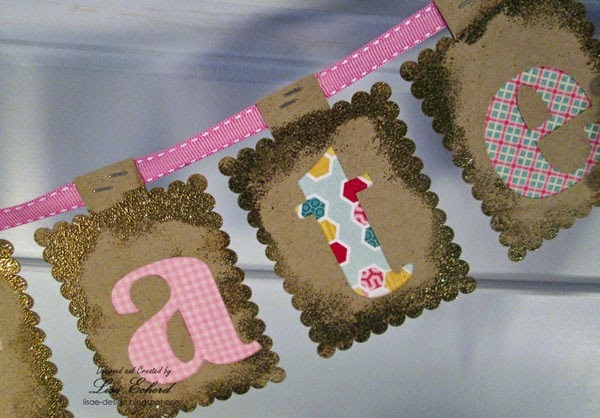 Sale-a-bration at Stampin' Up! happens every year in the first quarter. For every $50 in purchases, you get a free gift. I don't buy nearly as much from them as I used to but I still love their cardstock and a few other things. So I do a SAB order. 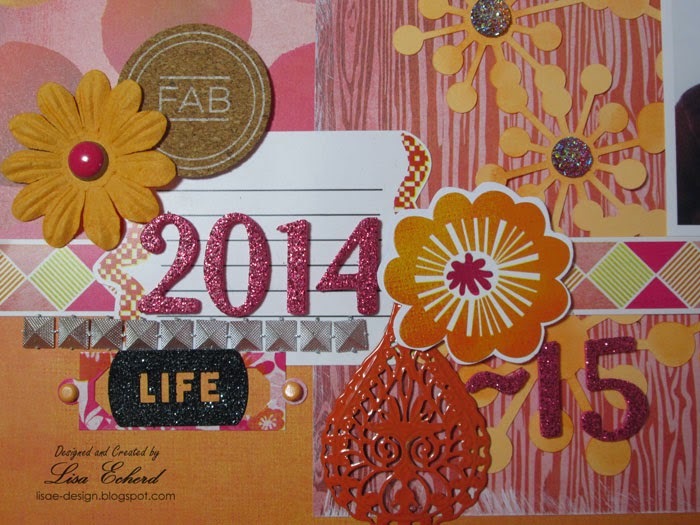 This year, I chose the Irresistibly Yours designer paper. This embossed cardstock is ready to be inked to show of the pattern. I took one sheet and cut it to fit 6 card bases trying a different resist technique on each one. Here are the cards. 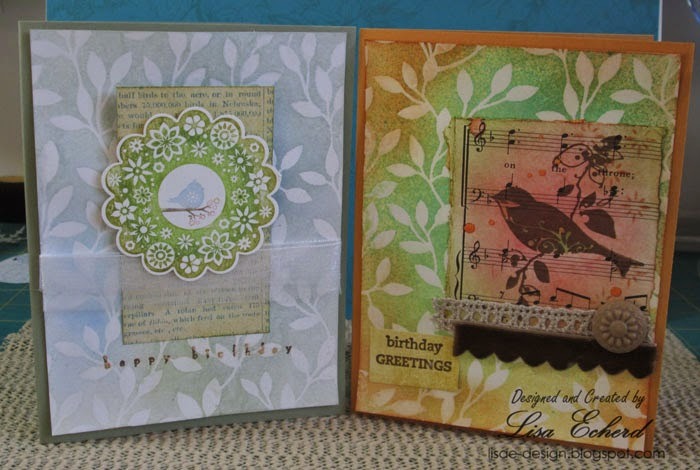 The video shares all the details of creating the background and an overview of the finished cards. And now I have a bunch of birthday cards for 2015 all ready to go. I just love a second chance! Back in November, TrueScrap individual classes went on sale at a discounted price for a few days. Lain realized that with all the holiday sales, this wonderful promotion might have gotten lost in all so she is offering the deal again. So through January 31, each class is at a great discount of $9.99 each. (regular $14.99). 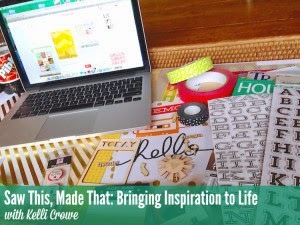 I love Kelli Crowe's class Saw This, Made That which helped me learn to use my Pinterest boards in creative ways. She shares 10 layouts in the class during her 30 minute video. 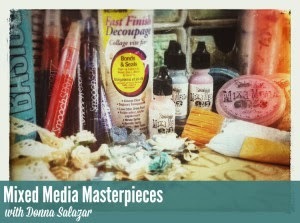 And from Donna Salazar's Mixed Media Masterpieces using Craft Supplies class, I finally know how to use my mists on mixed media without all the colors moving when you add more layers. She shares lots of other tips as well in her well presented class also with a 30 minute step-by-step video. Each class has a 'like you were there' video as well. I used to fuss with Microsoft Word and my printer. I think this was before anyone even made journaling cards. I would figure out what size journaling block I needed and cut it out of cardstock. Then I would resize my Word document to that size and type in my text. Then I would send the document to print inserting the often small piece of cardstock into my printer. Usually this worked although there were sometimes paper jams or I hadn't sized things right and would start over. Often the printer would rub a little black ink on the edge of my cardstock just to irritate me. Eventually I learned an easier way. I believe I learned this from Nichol Magourik videos (Thanks, Nichol!). Type up my text on regular paper, and then adhere my cardstock or journaling card or tag over the text and reprint. I've added one more step that makes it easier for me to line things up. Recently I had a question about how I printed on a tag so I did this video. 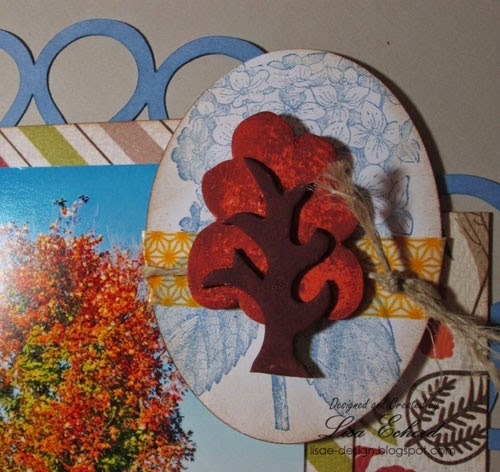 I've used a 3" x 4" journaling card but you could work with other sizes and shapes. 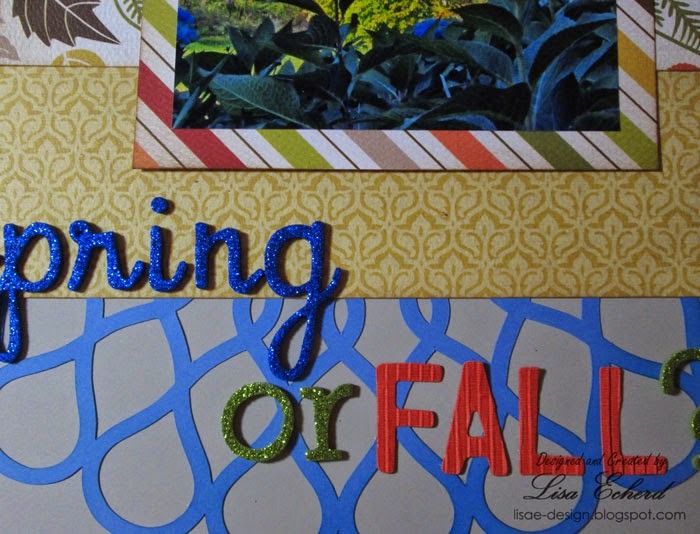 The card here is from my last process video for the layout "Spring or Fall?" Be sure to adhere your card well to your main paper so it doesn't come loose and jam. This is mostly about learning your printer and what it will handle. My old Epson will handle just about anything. In the video I also talk about what style of printer works best for this technique. I appreciate your questions! Thanks for watching. True blue is so hard to find in scrapbooking. I wouldn't necessarily expect it to be in fall papers anyway but that is what I needed for this layout about our hydrangea blooming in the fall. I shared the story here before. We had a late freeze that killed everyone's hydrangea blooms. Suddenly in fall, the bush was in full bloom and looking beautiful with the maple tree behind it. So the page in this process video captures that story and shares how to (and not to) add an extra color to your page. 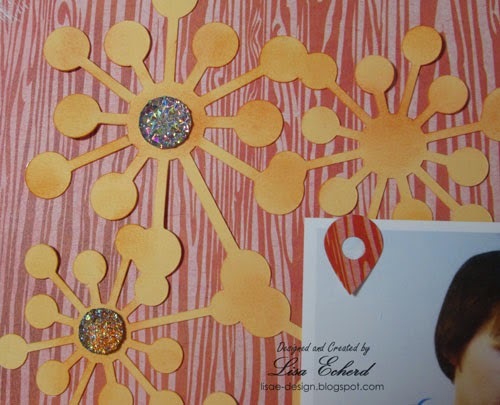 The embellishment is a combo of a chipboard element and a stamped background from a hydrangea stamp. This page also uses one of the sketches from the 2014 Sketchbook. A video on printing on journaling cards is coming along in a few days. Thanks for stopping by today! I'm not sure. But I'm going to find out on January 28. 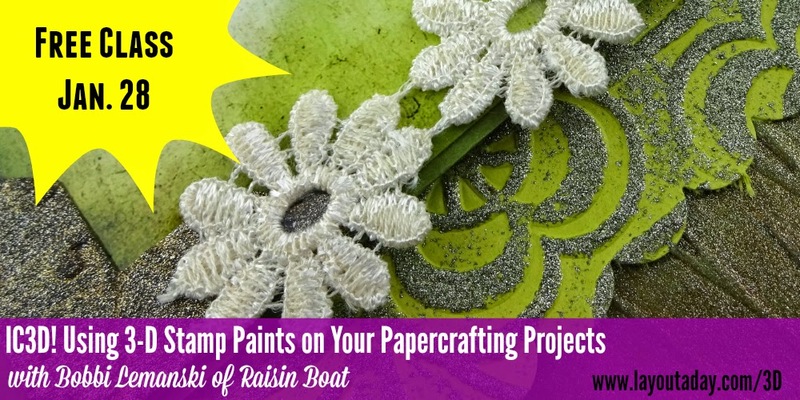 Bobbi Lemanski of Raisin Boat stamps will be doing the FREE January Scrapinar. She will share more about 3D paint and how to use it on papercrafting projects. I attended one of Bobbi's online programs and she is a very good presenter with lots of ideas. 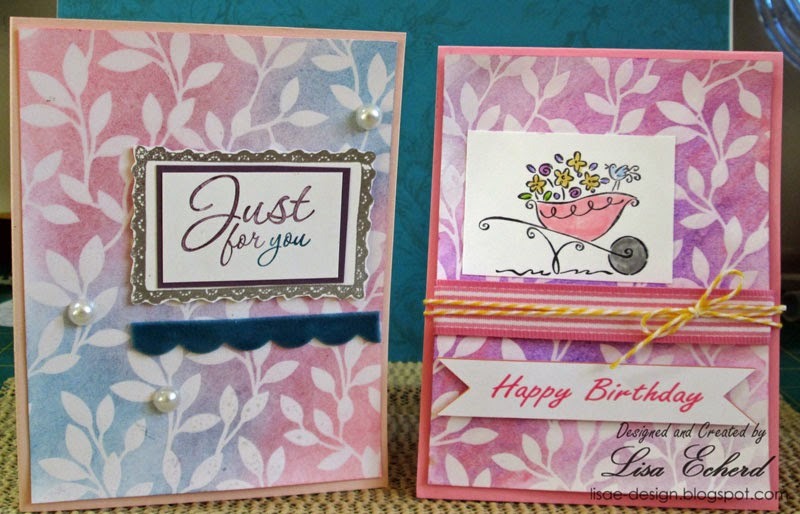 She creates beautiful cards as samples for Raisin Boat. I've CASEd quite a few of her designs myself. Register for the FREE Using 3D Paints event. When my dad ran his carpet business in the 1970's and 80's in particular, a lot of business came from houses under contract. I'm not sure how common that is today. I think most custom homes are built on spec. A contract house gave the owners a fixed price and an allowance to spend on fixtures and finishes. So they had x amount of dollars per yard on their carpet and wallpaper, not usually as much as they wanted to work with in the end but it could be done with that amount. The contractor would recommend to the homeowner various businesses that would help them work with their allowances. The homeowner also could pay above the allowance to get something nicer. My house was built on spec. So I didn't have a set allowance yet I still relied on my contractor for a lot of recommendations. Growing up in the home furnishings industry, I had some ideas of where to go for things but certainly not what electrician or plumber to use. I relied on my contractor. So contractors steer business to people they like to work with, businesses and subcontractors they can depend on. My dad was one of those. To thank them, each Christmas he gave out contractor gifts. Daddy may have waited until Christmas eve to shop for us, but he started on those contractor gifts in October figuring out what to give and procuring what he needed. The first year, he gave hand mirrors which I imagine ended up with the contractor's wife - not a bad idea. He gave candy, sheet cakes and eventually he settled on apples. Each October, he would have one of the apple houses here put back a 'box' of apples in cold storage. I think a box holds 17 bushes. At Christmas, they would be reboxed in bushels and Daddy would deliver them to the contractor's home along with a thank you card. 2007, when I did pretty boxes with handmade cards, chocolates, perhaps candles - I don't remember. Anyway, they were one of the things I did for customers who had me do a fair amount of work for them during the year. I can see why my father liked doing this so much. It was fun and people loved the gifts. Since I worked closely with my clients and in their homes, I was able to customize my gifts based on decor and personalities. For the page, I used a 2014 sketch which is in my new Sketchbook (more info here). I added a 3rd photo to this one sneaking it in on top of the other two. I also flipped the entire thing around. Thanks for stopping by today. I hope you will check out the sketchbook. Thanks to so many of you who have purchased it. I hope it helps you enjoy your scrapping process even more. Note: Today is the last day to get 20% off LOAD Layout A Day in February with code READ. More here. Discounts are ending very soon for two events. 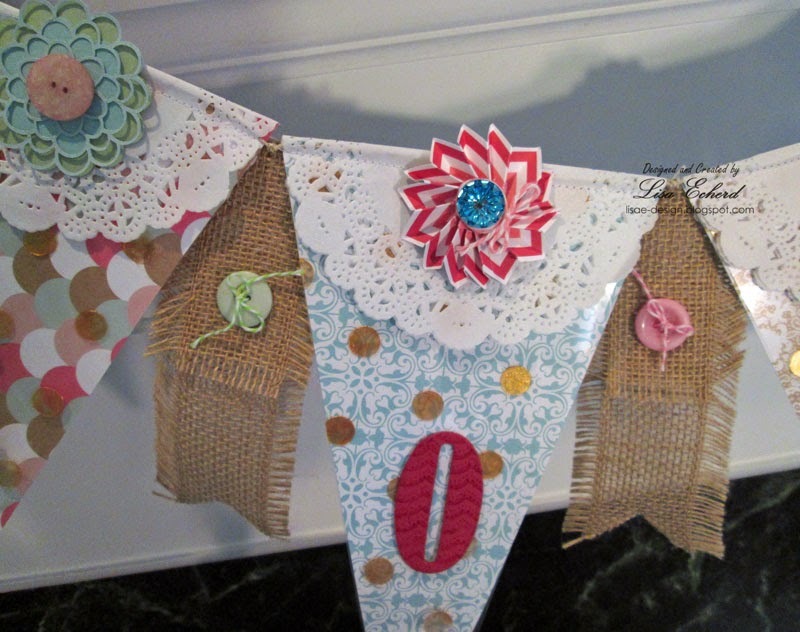 TODAY is the last day to save $50 on TruthScrap, a new event about incorporating faith into your crafting. (Discount code NEWYEAR). Over 250 people have already signed up for this one day event. Get more details here. Tomorrow is the lat day for LOAD discount. In February, I will be participating in LOAD - Layout A Day. I love all the pages I created during LOAD last year. You get tons of inspiration and support. 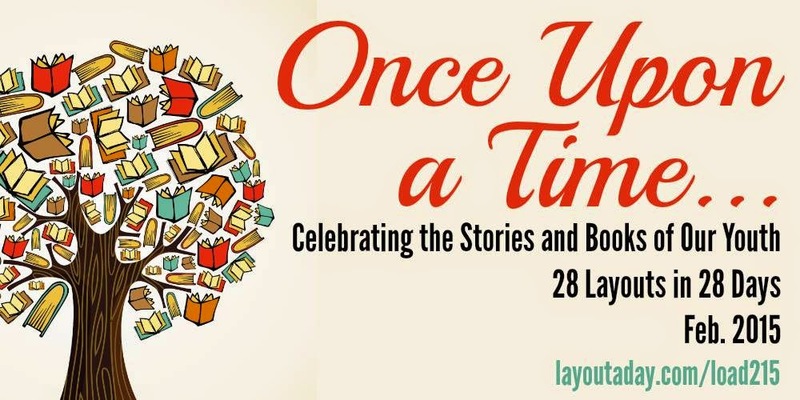 This years theme is about stories from our youth and promises to be an opportunity to scrap those stories you might not capture otherwise. Save 20% through Saturday January 10 with discount code READ. More info HERE. 2014 Sketches in one place! The 2014 Sketchbook has arrived! Like last year's PDF, there are 52 sketches to scale with links to the process video that accompanied each sketch. I've made a couple of improvements. The 2 page sketches have a 1": 4" ratio sketch so you can see the two pages side by side AND a 1": 2" ratio sketch so you can see them up close just like the 1 pagers. Also, I added a Supplies Index. If you have say a bunch of Washi tape and you want to use it on your layouts, no problem. The index will give you tons of sketch options for your that use Washi. Or your brads, twine, flairs, 6x6 pads, etc. Click on over to the Sketches PDF page for more info and to purchase this ebook for only $8 US. Thanks for all your support of my products and your wonderful comments! Every year I do a layout to wrap up the old year and ring in the new with what was accomplished and what is planned. This is always a special page for me and a bit of a challenge. There is a LOT of journaling to contain. The page has an extra large pocket for the journaling and uses a lot of the stickers from the collection. 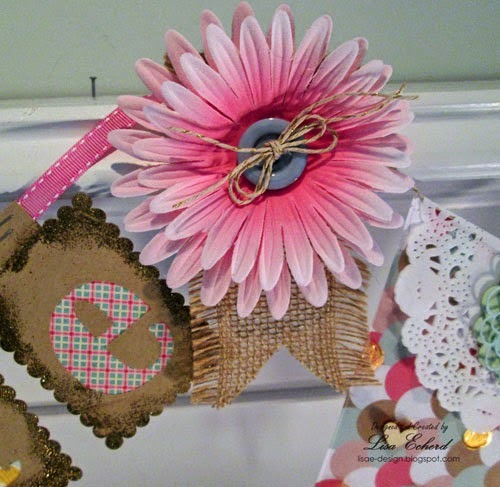 I also used some Shimelle cork stickers, some brads, flowers, and trim from Hobby Lobby. Something I definitely want to do in the new year is use my Silhoutte even more. So I used an image I already had and cut it for a photo mat. Thanks for stopping by today! I'll have the 2014 Sketchbook with 52 scrapbook sketches out very soon. It is getting the finishing touches right now. 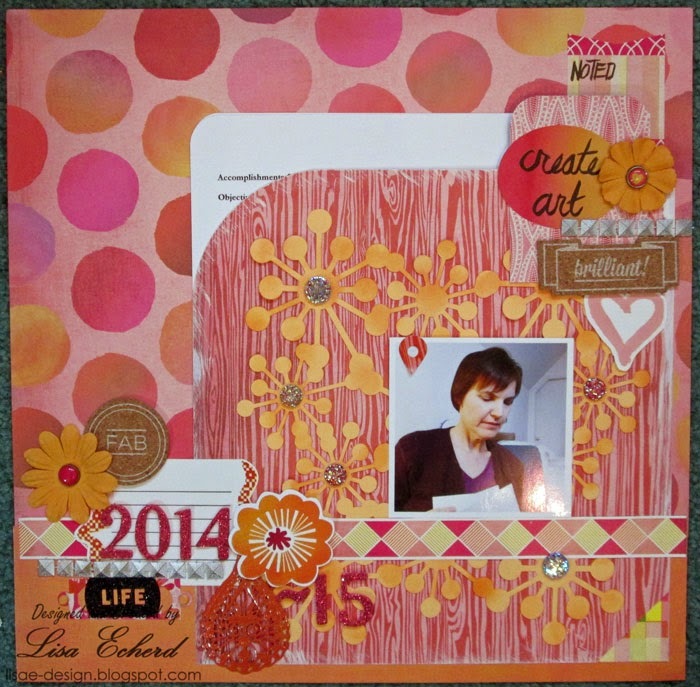 Happy New Year ... more scrapbooking, anyone? What are your plans for 2015? Any scrapping goals or resolutions? I'm always seeing posts about how everyone wants to do more scrapbooking, use more of your stash and just get stuff done. Last year, I participated for the first time in LOAD - Layout A Day in February. This month long event really gets you scrapping. 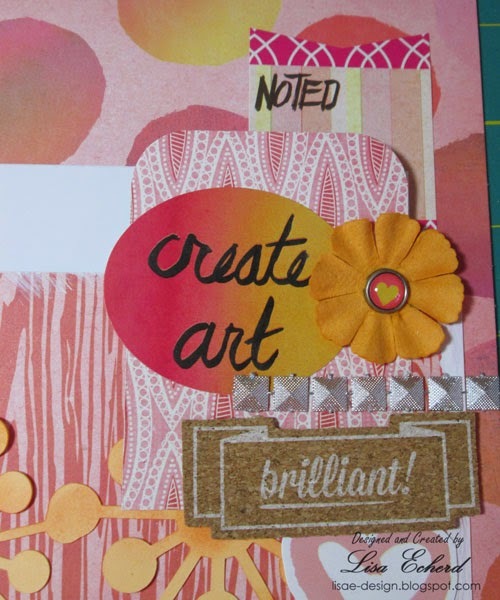 There is a theme for the month and a prompt with video to challenge you to create a page. Often the themes really get you thinking. I LOVE the pages I made during LOAD. I did 18 pages for the month of February and 22 in May (and we were gone one week that month!) So I didn't quite make 1 every day but I'm still delighted. I think those are record numbers. You get lots of support from the scrapping community that participates. It is like a crop only you don't have to pack, drive and spend money on accommodations. You just work in your own scraproom and share your creations on-line. And speaking of the new year, I wanted to share my resolutions which are actually the same as last years. Last year I wrote up a blog post here that talks about what makes a resolution stick - you have to gain enough benefit to be motivated. The first one below stuck until May and then I fizzled. The reason is that my incentive went away. Part of my incentive for cleaning was to check my item off the list each day. I ran out of my preprinted list and thought I could do without it. Apparently I could not. 1. Do one household chore per day. Now I still cleaned just not as often as I did with the resolution and the list. So I want to try this again. I know I can do it. I really enjoyed spreading the household chores out once a week. This idea originally came from Ashli Oliver at Purplemailbox.com from her "Fitting it in" series. My second resolutions has been an off and on thing. Some days I'm really good at it and others not. I certainly appreciate when I walk into a clean kitchen in the morning or don't have to search my closet for something to wear. And these things get me to my ultimate goal of scrapping early in the day when I'm at my best. Remember: A resolution is not a goal. It is changing a habit. It might lead you to your goal as mine can help me with my goal of getting more scrapping done particularly in the morning when I'm most creative and energetic. So what are your plans for the new year?